Lucasfilm and Del Rey Books released the first preview excerpt from the upcoming novel Star Wars Battlefront II: Inferno Squad today in USA Today. The novel serves as both a prequel to the campaign mode in Star Wars Battlefront II and a follow up to Rogue One: A Star Wars Story. 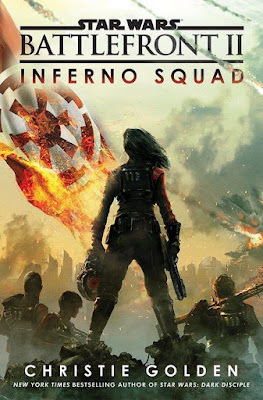 The book will see Inferno Squad, led by Commander Iden Versio, tracking down the surviving members of Saw Gerrera's partisans who made it off Jedha following the Death Star attack. Inferno Squad is written by Christie Golden, who has previously written the novel Star Wars: Dark Disciple. The novel is slated for a release on July 25th. Star Wars Battlefront II: Inferno Squad hits shelves on July 25th. The audiobook, which will be released the same day, will be narrated by Janina Gavankar, who voices Iden in the game. Star Wars Battlefront II will be released for Play Station 4, Xbox One, and PC on November 17th.